Banh Mi – Oh My! In case you’re not familiar with Banh Mi, it’s a Vietnamese sandwich typically served with grilled pork or tofu on a crusty, french baguette. It can be topped with a variety of things: most notably cilantro, which gets used a lot in Vietnamese cuisine, as well as cucumbers, carrots, jalapeno peppers, spicy chili sauce, sometimes a Sriracha & mayo-like concoction – it really depends on where you’re going. Bahn Mi has really gained popularity recently and many restaurants and sandwich shops offer all kinds of variations (and bastardizations) of this sandwich. Here in Philly, everything that is on a roll is referred to as a “hoagie”. I hate the word hoagie; it just sounds so vulgar. Growing up in New York, I’m more familiar with terminology like “sub” or “hero”, or even from my short time living in New England, “grinder”. 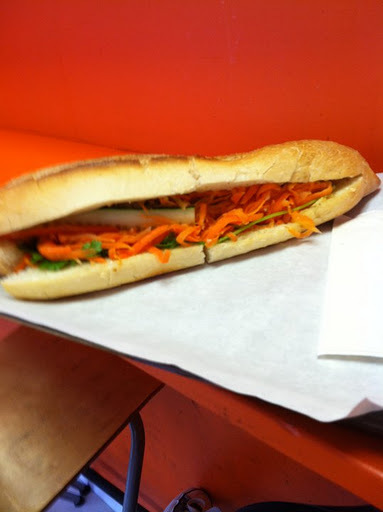 So hearing a Banh Mi called a “Vietnamese Hoagie” here kind of made me cringe a little bit. The first place I ever tried a Banh Mi was at Cafe 900, located at the corner of 9th & Arch in Chinatown. Oh sure, QT is the famous place in these parts, but I was intrigued to see what else the area had to offer. This place offers one of the cheapest “hoagies” around; $3.50 compared to QT’s $5.50. It was flavorful and delicious. Good amount of toppings. Definitely didn’t disappoint for the price of breaking my “Banh Mi virginity”. The second sandwich I had was at this little place inside of an Asian grocery mart in Houston – somewhere near Minute Maid park and I can’t recall the name right now. A friend and I split a vegetarian banh mi which contained lemongrass tofu. O.M.G. If I thought my first time was good, the second time was amazing. There’s a lot to be said for tofu. It can either be really bland or really delicious and in this case, definitely delicious. The moisture of the tofu mixed perfectly with the crustiness of the bread and had just the right amount of toppings and sauce. I wish I could remember the name of it, but maybe it’s best that I keep that place my little secret. A few months later, I decided to take a trip to the reknowned QT Vietnamese sandwich shop, located at 10th and Arch st. Some people love it, others hate it. Which side of the fence would I fall on? I decided to go with the lemongrass tofu banh mi since I enjoyed it so much in Houston and I was extremely disappointed. This proved to be one of those instances of tofu being extremely bland. I could barely even taste the lemongrass and it was overwhelmed by an excessive amount of toppings and hardly any condiments that would lubricate the dry bread to help it go down easier. Luckily I had order a Thai tea (amazing!) to wash it down, but even still it was difficult to swallow. Next, I decided to go the traditional route, classic pork banh mi, on a trip to the now defunct Tyson Bee’s food truck (Formerly located in University City across from the Penn museum.This summer they parted ways with business partners and I never got to return. It was rumored that the truck would remain in it’s spot but I haven’t heard anything about it since.) This time, I was not disappointed. The bread had the right amount of crunch, right amount of sauce & toppings, flavorful meat; so delicious & juicy, I even got a stain on a brand new shirt and wasn’t even pissed about it. The sandwich was that good. Plus, their Thai tea was the perfect compliment and not just a remedy for jamming an overly dry sandwich down my throat. Lastly, I went the bastardization route. I read over on Midtown Lunch that a rotisserie place had just opened on 21st and Chestnut that was offering Chicken Banh Mi – and that it was actually good! So I decided to go on over and check it out for myself. Skeptical at first because it was already pre-packed in a cardbox container, once I opened it and tried it for myself, I was pleasantly surprised. 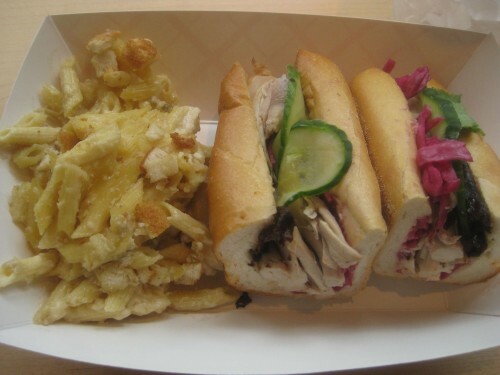 Even though the overall look of it wasn’t much different then a cold chicken sandwich, the chicken was flavorful, as was the cabbage and pickles with a delicious sriracha mayo sauce on top. Paired with a side of their homemade mac & cheese, I definitely came back the following week for round 2. Since this type of sandwich has increased in popularity (I’ve seen it offered on several menus around town), I’m sure I’ll get around to trying it at a few other spots and give you guys my feedback! Posted in banh mi, food, hoagie, philly. Bookmark the permalink.